Johnson babies: Which of your multiples is the oldest? 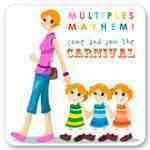 I am writing this as part of the Multiples & Mayhem Carnival being hosted over at Mari's World. Because I'm hoping this itself might generate a few readers I wanted to write my random stream of consciousness, with the hope that people might contribute their thoughts. There have been some excellent, thought-evoking posts recently, on the decisions we take as parents. Trouble Doubled recently asked about whether people dress their twins the same. On a non-multiple related issue, Blue Bear Wood raised the question of gender differences. And these all get my brain itching. And then recently I received a notification that TAMBA had released some more material from their honorary consultants about the relevance of birth order. By my own interpretation, the consultant recommends not telling multiples of the order in which they were born, and the rationale for this is the roles that will be adopted- of older, responsible child, and younger, baby child. And then the itching really starts. I am not sure where I read it, pre-twins arrival, but it was along the lines of- name the first born with the alphabetically latter name ie 'Tom', and whilst you will call them in that order ie 'Tom & Seb', when they get to school the child with the name first in the alphabet ie 'Seb' (you knew where it was going by this point, didn't you?!) will appreciate thier name coming first. I had got very used to the boys being "Tom & Seb". Until Christmas and their Birthday, when people wrote or called them "Seb & Tom", and at first I noticed it, and was surprised at how much I had grown use to 'the order'. And I have never thought too much about Tom being older, that is the way it is. It is usually one of the initial questions people ask, and I usually try to answer people honestly! So, should I tell the boys they were born on the same day, and not get drawn on who is older. And why is this yet another decision parents of multiples need to consider? I am a middle child, I have an older brother and a younger brother. Yes, we have all been constrained by our place in the family- both for positive, and not so positive reasons. There wasn't much getting away from it. So, should multiples be treated differently? Is it not just the way it is- one was born first. And I was sort of happy with this resolution. Until my little brain started ticking further. And I thought- do I actually know which twin is older? Twin 1 is given 'his' name simply because 'he' is most likely to be born first. Despite Tom being Twin 1 throughout pregnancy, if Seb had made a break for freedom first he would automatically have gained the title 'twin 1'. It is not really due to who is older, that surely is to do with which egg was fertilised first, and I'll be damned if I know that. Who arrived first, yes, I know the answer to that. So, does that mean, when asked the question, I can legitimately say I don't know who is older. I just know who was born first. Don't you just love semantics! And as you can see, I really am confused on this issue, so any views really would be gratefully appreciated. Please! This is a can of worms. I'm off for a cup of tea to think about it some more. Great post, very thought provoking! I know!!! Tom was born first but was always tiny compared to Seb, so we call him "the little, big brother", and even a year on he's still more slight. I think we'll see where they take us!